Some churches are able to display a list of former Vicars, giving the dates of their incumbencies in a continuous line from the Middle Ages to the present day generally drawn up from the documents in particular the returns of baptisms etc. held by their Cathedral libraries. Calverton was in the Peculiar of Southwell Minster: the returns were not therefore sent to the Diocese but to Southwell – and their records are by no means complete. It is only possible therefore to give a list of those Vicars whose names appear in various documents, and the date which is mentioned in connection with each reference. In the list below, the dates on the left are of the year in which it is known that the person named in the succeeding column was Vicar of Calverton and usually there follows a reference to the source of such information. Where possible, clergy who assisted in the parish are also named and this information is in brackets. It must be remembered that the word ‘clerk’ originally meant ‘a man in a religious order, a cleric, a clergyman’ and sometimes a name has been included because of this. Inevitably, this list is vague and there may be inaccuracies. 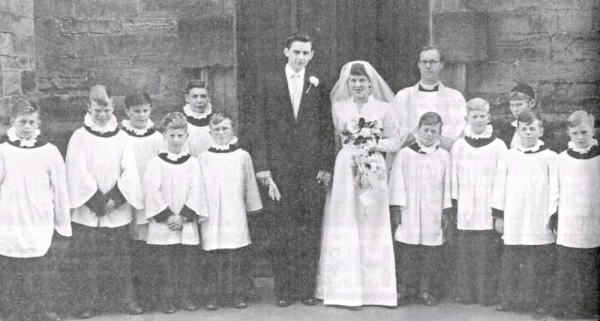 1958: Reverend Thomas Hoyle takes a wedding service. Date: Name and other details where possible. 1086: The Domesday Survey says: ‘There is a church and a priest’. 1224: Henry, Priest of Calverton. York Episcopal Register: 8th year of Henry 111. 1289: John de Calverton: York Episcopal Register: it tells of his ‘absolution and restitution to fame after purging a charge of beating William de Wympton (a boy) till his back was a mass of bruises. 1334: John Bolrone: a list compiled by TWS. 1341: Robert de Calverton: Victoria County History: p. 114. 1379: John de Calverton: Victoria County History: p. 125: elected Prior of St Peter, Thurgarton, died in 1381. 1409: William Oliver: 'on the presentation of John Fitzherbert,' Prebendary of Southwell (Southwell Records). 1536: William Oliver: (obviously not the same man…..) (Southwell Records). 1552-53: William Smith: (Southwell Records). 1554: John Michell: Torre Ms: Patron Philip & Mary I. 1560: William Hall: admitted vicar 10th May, also of Oxton (Southwell Records). 1568: John Hill: ‘on resignation of William Hall’ (Southwell Records) (George Dombyll, Clerk – Calverton Parish Records – George Bowman the sonne of Robert Bowman was baptised the 21st of September, George Dombyll, Clerk, William Blanche, godfathers, John Labray’s wife, godmother’. This is not a typical entry: no other entry lists the godparents – and the Labray family were related to the family of William Lee). 1574: Richard Burgess: 5th May; ‘on deprivation of John Hill’ (Southwell Records). 1584: James Revell: 29th August: (Southwell Records). (William Lee is described as Curate of Calverton, and as having been such when he invented the stocking frame in 1589). 1590: James Revell: again mentioned in the Southwell Records. 1620 Circa: January 22nd: James Revell, late Vicar of Calverton was buried: Parish Records. 1622: Mark Baguley: married November 25th 1622 (Southwell Records). 1651: Thomas Whalley, ‘Clerk and Schoolmaster, buried June 27th’ (Parish Records). 1654: Thomas Ogle of St John's College, Cambridge, Vicar of Calverton and Woodborough. Henry Walker. 1655-6: James Stephenson (to about July 1656) Copnall, Notts. 17th century records, Southwell. 1660-1662: John Allot: Parish Records ‘Ann, daughter of John Allot, Vicar of Calverton’ was baptised. 1662-3: William Seddon BA: 15th February ‘on death of last incumbent’ (Southwell). 1663-4: Gerard Didsbury: (Southwell Records). 1667: Samuel Palmer: Parish Records: ‘Samuell, son of Samuell Palmer, Vicar’ was baptised Feb. 13th 1667. 1669: ‘Jacobus’ (James) Truman: 7th April – ‘on cessation of G Didsbury’. I have no explanation of this discrepancy (Southwell Records). 1670: John Hill MA: 6th September, ‘on cessation of J. Truman’ (Southwell Records). 1672: Edmund David, BA. 4th November. ‘Vacant by lapse’ (Southwell Records). 1687: Edmund Davies (Southwell Records). 1705: Joshua Mon, Vicar of Blidworth, Curate of Calverton and Woodborough. 1714: Edmund Davies buried, September 14th (Parish Records). 1715: John Haywood: ‘on death of E. Davies’ (Southwell Records). 1717: Thomas Elcock MA. (Southwell Records). 1720: Thomas Allen BA. ‘on cessation of T. Elcock’ (Southwell Records). (Dan Harding, Curate). 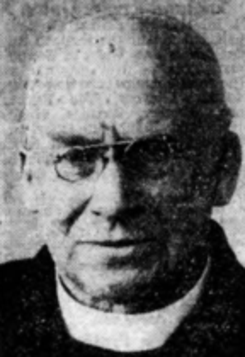 (William Allen, Vicar of Oxton, Curate of Calverton). 1735: Maurice Pugh MA. Jan 16th, his son was baptised (Parish Records). 1740-41: Maurice Pugh –‘on death of Thomas Allen MA’ (Southwell Records…..I have no explanation of this discrepancy). (Revd. William Lamb). 1766: William Becher BA.‘on death of M. Pugh’ (Southwell Records). 1767: (Hugh Thomas, Curate of Calverton and Woodborough). 1771: Samuel Drake, BA. ‘18th April, on cessation of W. Becher’ (Southwell Records). 1773: James Bingham: ‘21st October, on cessation of S. Drake’ (Southwell Records). 1791: James Bingham Junior. (Southwell Records). 1795 –1805: (Samuel Oldacres, Curate). 1799: (Revd. John Ashpinshaw ??). 1801: (John Hall Clay, Vicar of Blidworth and Oxton, resident in Calverton). 1823: Bingham Copestake, Vicar of Calverton (4th Feb: Agreement re Churchyard). 1905 –1911: Charles Percy Smith. 1912 –1925: Willie Alfred Arnold, MA. 1925-1930: Arthur Basil Brooker, BA. 1956-1985: Thomas Oldland Hoyle, MA.